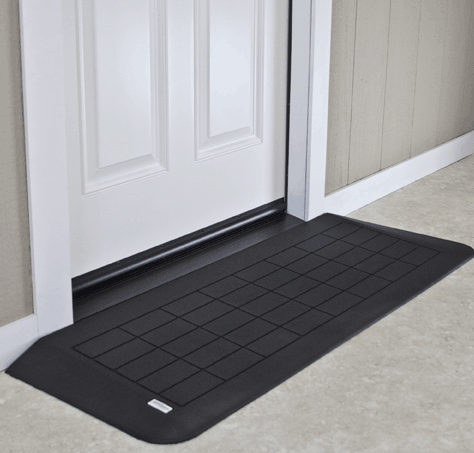 EZ Edge Threshold Ramps are doorway threshold ramps made by SafePath Products that provide exceptional quality and design to allow wheelchair and scooter users to smoothly roll over daily barriers like home entryways, door threshold and more. 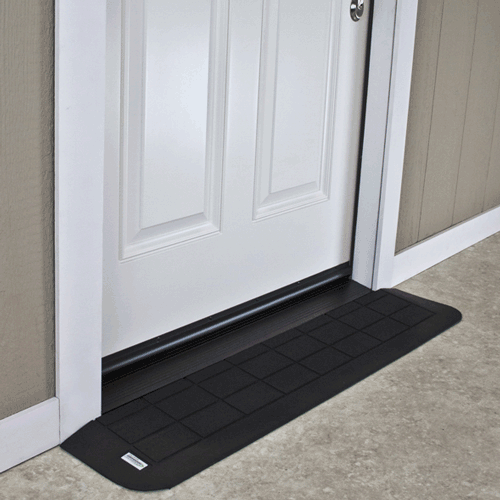 With no weight limitations, these wheelchair threshold ramps are made to rest on any flat surface with their non-slip features. 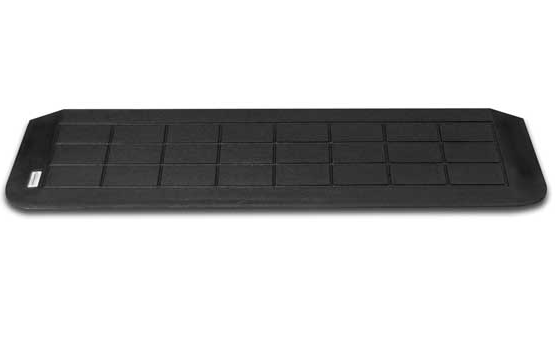 The ramps are made of 100 percent recycled tire material, the ramp's grip on stone, concrete or almost any other flat surface holds true, including the grip above to keep your tires rolling and gripping the ramp without slippage. 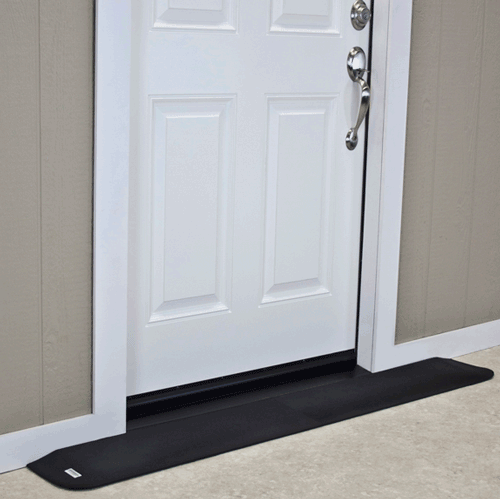 The EZ Edge Transition Threshold Ramps are ADA approved and have a lightweight design. 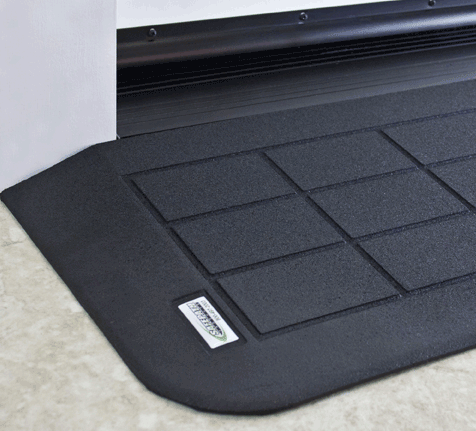 The slopes are less than 7.5 percent making it easy to install and roll across these convenient transitional ramps. 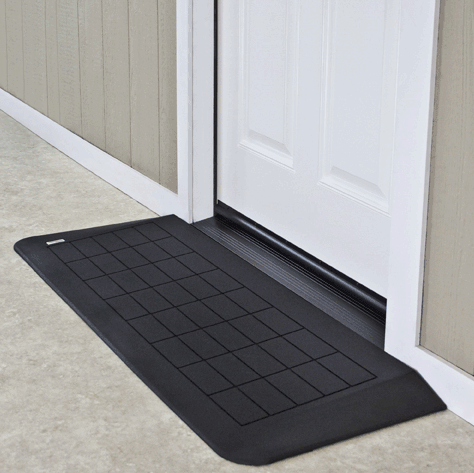 EZ Edge Wheelchair Ramps are designed for entryway doors, sliding glass door entrances, patio doors and showers and have the highest anti-slip rating on the market. The ramps are acceptable for residential and commercial applications, are code compliant and can be customized on site with a utility knife. 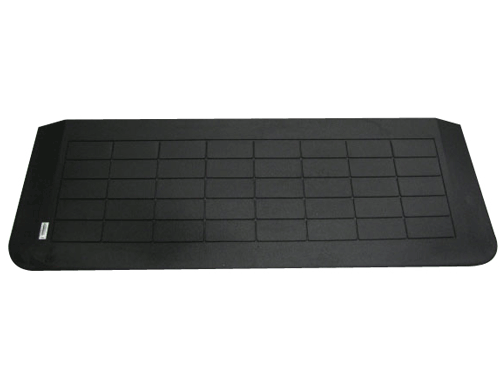 Unlike aluminum ramps, these rubber ramps will not fade, crack or deteriorate and maintain a high performance in all weather conditions and are resistant to freezing. Note: Due to shipping constraints, ramps 60 inches and above have Two Piece Construction and will ship in 30 inch sections. There is a slight seam in the middle but virtually undetectable. This applies to all the following product numbers: RAEZ0040, RAEZ0080, RAEZ0140, RAEZ1140, RAEZ1180, RAEZ1340, RAEZ1540, RAEZ2160, RAEZ2180, RAEZ2195. 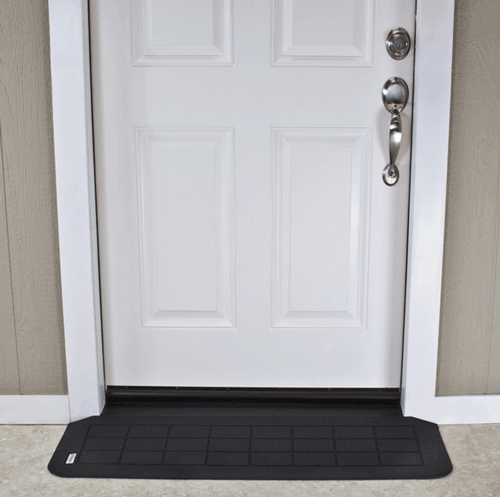 You may also be interested in similar doorway ramps, such as EZ ACCESS Threshold Ramps. No weight limit and ramp comes in many sizes to allow passage over daily path barriers and entry thresholds. Extraordinary durability will not fade, crack or deteriorate. Ramp Product Numbers: RAEZ0010, RAEZ0020, RAEZ0030, RAEZ0040, RAEZ0050, RAEZ0060, RAEZ0070, RAEZ0080, RAEZ0110, RAEZ0120, RAEZ0130, RAEZ0140, RAEZ1150, RAEZ1160, RAEZ1170, RAEZ1180, RAEZ1110, RAEZ1120, RAEZ1130, RAEZ1140, RAEZ1310, RAEZ1320, RAEZ1330, RAEZ1340, RAEZ1350, RAEZ1510, RAEZ1520, RAEZ1540, RAEZ1530, RAEZ1550, RAEZ2100, RAEZ2120, RAEZ2130. 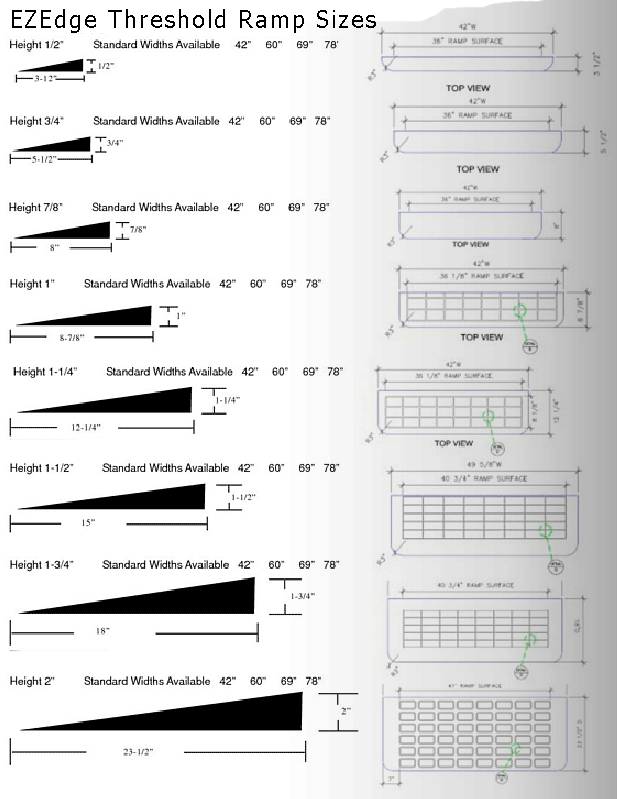 Which one would you recommend for a transition over a garage to inside the home ramp? We cannot make any recommendations regarding products on our site. It's best to contact the manufacturer for specific information. This threshold ramp was perfect for my husband's wheelchair. Nice heavy quality rubber and good looking as well. I needed ramps for inside to transition from carpet to hardwood floors where there was a 3/4" elevation that was difficult for the wheelchair. I like the quality of this ramp, very heavy duty rubber that will really hold up. The ramp was too wide, so a neighbor was able to cut it to the width I needed. The burning rubber smelled awful, but getting the perfect length was great. Wheel chair customers have no problem getting over the 2in edge on our main entrance now. Haven't seen any walking customers stumble since we installed it. Thanks! 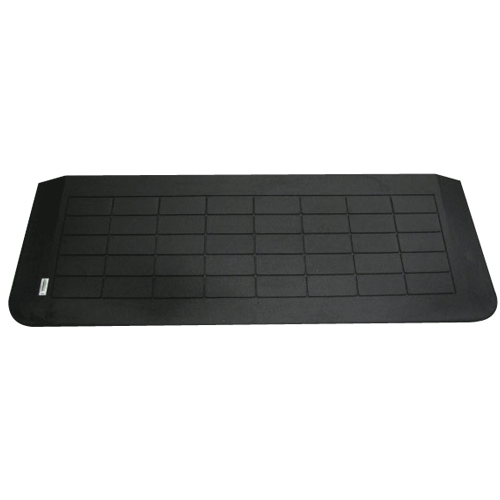 Excellent product that performs as described and a fantastic price, especially when compared to other brands. Provides a very smooth transition over the threshold. I called the manufacturer to ask a question before I purchased the item and they were very pleasantly helpful and knowledgeable. We developed a gap between the end of our access ramp and the driveway. The threshold ramp fills in the gap and keeps the transition smooth for my husband. Gave us just that little 1/2" for rolling up to the porch lift. Excellent product! Return transactions are slow though. It's been almost 10 weeks since we returned our first purchase and order a different size. We still have not received a refund for the return. However we are happy with the threshold ramp. This replaced an oak tapered threshold in a small general store entryway. Going with wood gave us problems for years but, since this is in, maintenance is easier and traffic is safer.